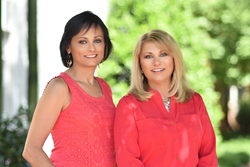 TTR Sotheby’s International Realty is pleased to announce that Pam Cornelio and Frida Hopper of the Pam and Frida Team have joined the firm in its Old Town Alexandria, Virginia brokerage. Pam is a native of Pine Brook, New Jersey and spent most of her early life in and around New York City. An exhibited artist, Pam graduated from Kean University with a degree in Visual Communications. Her natural talent and love for the arts have served as a strong foundation in her sales and marketing career, and her new affiliation with Sotheby’s International Realty and the venerable Sotheby’s auction house is a natural progression for her expanding success. Pam is honored to be member of a number of prominent professional organizations including a Lifetime Member, Million Dollar Sales Club, Lifetime Member, Top Producers, SRS Designation, and Washingtonian and Northern Virginia Top 99 Realtors in both 2015 and 2016. Married with three children, a daughter and twin boys, the whole family enjoys soccer. Frida began her real estate career in 2010 as Pam’s Marketing Manager. She then secured her real estate license in order to assist clients with all aspects of the transaction, including working with buyers and sellers. Born in Lebanon, Frida is fluent in Arabic and looks forward to expanding the global reach of her business. She is married with four daughters and is very active in her daughters’ schools and soccer clubs. As one of the top brokerage firms in the Washington region measured by sales volume, TTR Sotheby's International Realty is recognized for it’s long-standing commitment to philanthropy and community leadership. The firm ranked first in on the list of the Top 50 Most Philanthropic Small Companies in the Washington Metropolitan Region by the Washington Business Journal in 2015. This community leadership was a major draw for Pam and Frida and will continue to be an integral part of their growing business. The Sotheby’s International Realty network currently has more than 14,500 sales associates located in approximately 700 offices in 52 countries and territories worldwide. As the Sotheby’s International Realty affiliate for the Washington region, TTR Sotheby’s International Realty’s main office is located at 1206 30th Street, NW Washington, DC 20007. For additional information, please contact Mark Lowham, Managing Partner.